Peerless Paper Mills Inc. (“Peerless”) was one of the Country’s largest and most successful wholesalers of paper products and janitorial supplies. The company, with annual sales of over $75 million, was headquartered in Oaks, PA with branches in Illinois, Maryland, Minnesota, Ohio, and Pennsylvania. As the industry consolidated, the company’s owners faced a dilemma. Large, publicly-traded companies from both the U.S. and Europe were becoming increasingly active in the Company’s niche. Several of these companies approached Peerless regarding a potential acquisition. The dilemma for the owners was: Do we attempt to fight off these much larger, much better capitalized companies or do we join one of them? Peerless engaged Ameridan to help the Company’s shareholders assess their options and effect the chosen course of action. Ameridan went to work on several fronts. We assessed the company’s alternatives to selling, confidentially initiated discussions with potential strategic acquirers in the U.S. and Europe, and explored partnerships with selected private equity groups. Over the next nine months, we worked as part of the company’s team of professional advisors to structure and effect a sale of the Company in a way that met the shareholders’ stringent objectives. 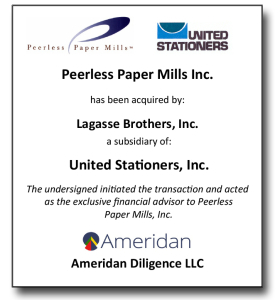 The engagement was successfully completed when Peerless was acquired by Lagasse Bros., Inc., a subsidiary of United Stationers, Inc. With annual sales of $5.1 billion, United Stationers is North America’s largest distributor of business products to resellers and has over 70 distribution centers across the U.S., Mexico and Canada. Total transaction value exceeded $35 million. Distributor of structural steel beams, shapes and other metal products. Authorized US Steel distributor offering steel pipe and associated services. Producer of powdered metal bushings, fasteners, and highly engineered parts.